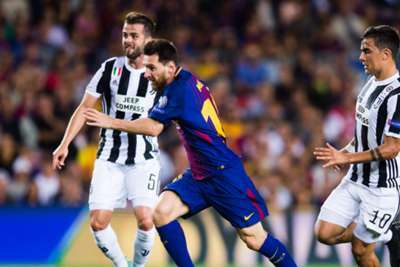 Juventus star Paulo Dybala has hailed Lionel Messi as "Maradona for our generation". Dybala will come face-to-face with fellow Argentina international Messi when Juve host Barcelona in the Champions League on Wednesday, with both sides set to progress from Group D.
Messi scored twice and turned in a dazzling display as Barcelona won 3-0 in the teams' initial meeting this season. Since that game, the five-time Ballon d'Or winner produced a virtuoso performance to score a hat-trick in Ecuador and wrestle Argentina almost single-handedly to the 2018 World Cup. Dybala looked on as an unused substitute in Quito and believes Messi compares favourably with Argentina icon Diego Maradona. "I have always admired Ronaldinho," Dybala told Football France when discussing another Barcelona favourite. "But Leo is like Maradona for those of our generation. "For me it's an honour to play with him in the national team. "He dragged us to the World Cup with the hat-trick in Ecuador. He is a born leader." In a wide-ranging interview, Dybala expressed a desire to one day play alongside Messi's former team-mate and Brazil superstar Neymar – two players the 24-year-old hopes to vie with for Ballon d'Or honours over the years to come. "I'd like to play with Neymar in the future," Dybala added. "At the moment he is the one closest to winning it, being closer to the level of Messi and [Cristiano] Ronaldo. "I have to work to improve and win trophies. Once, in front of a bonfire with friends we all made a wish – my own was to win the Ballon d'Or."